When I went into the forest to do my devotional on Sunday, I found myself dwelling on everything I wasn’t doing enough of: practicing meditation or trance, magical work, studying Irish, studying herbalism… My ritual itself felt a little melancholy. It was such a chilly, overcast day. All the lovely autumn colors from the last couple weeks had blown away. Ravens chuckled in the distance, reminding me at once of An Morrigan and her connection to death. The veil is thin, Samhain is coming, and the natural world both dies and prepares for slumber. Once inside, I gradually began to realize all the ways that I am living and growing spiritually. I am doing my best to maintain a positive relationship with the Kindreds by giving offerings and saying prayers of gratitude. I practice simple, practical forms of magic – folk magic, kitchen magic, basic shielding and grounding. I may not be actively studying Irish each day, but I’m learning when I can. I may not be reading as much as I used to, but I’m fitting that in when I can as well. I’ve started to journal each Sunday afternoon, and my liturgy journal shows growth and reflection. Most importantly, I’m sharing the joy of life’s most basic magic with my daughter. We sing and dance to music, delight in simple stories, and enjoy expressing our creativity with art. We explore nature together, and her complete awe in everything has awakened something deep inside me. Lately, a majority of the books I read are my child’s. We read them together – fiction and non-fiction, verse and prose. She hears my prayers and sees me make offerings. My Druidism is growing as fast as an oak, which is okay. The experience of tending to my little acorn is just part of my journey. It is teaching me to be patient and nurturing, and to reconnect to the world’s most primal and joyful magic. “Chillin'” probably isn’t the right word since the North Country, only just recently recovering from a huge snow storm, is experiencing a bit of a heatwave. It was a rainy day, but several people from Northern Rivers took advantage of the break in winter weather and met up at a coffee house in Clayton, NY. We had a fabulous time chatting about ADF liturgy and planning our Imbolc rite. We even had a new person show up which was delightful! A plaque I purchased from an artisan at the last CNY Pagan Pride Day. 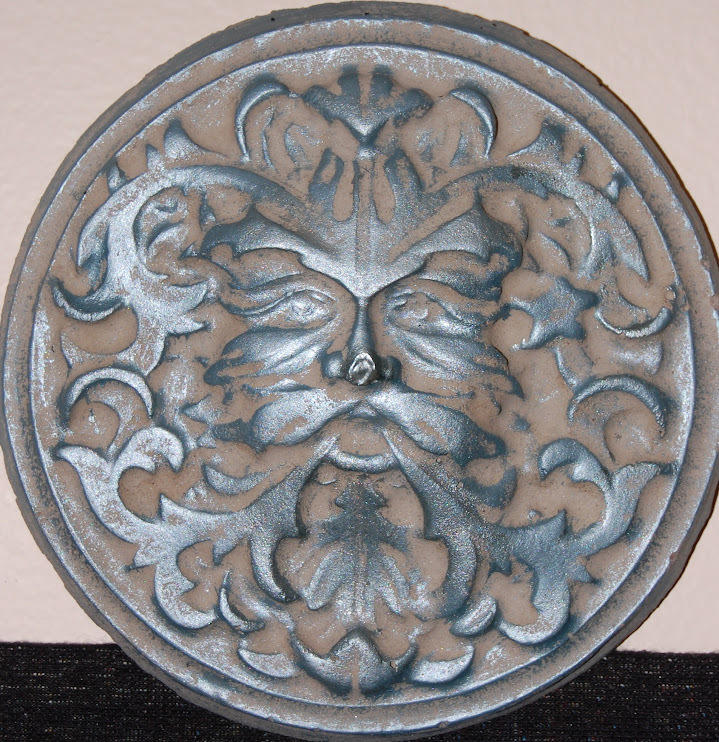 Although normally seen as a Greenman motif, this plaque was done in blue which automatically made me think of Manannán mac Lir. This plaque now hangs above my altar. Photo by Grey Catsidhe, 2013. The ADF discussion group on FB was recentlly abuzz with a discussion on the gatekeeper concept within our liturgy. It’s a hot topic for some – whether it should be required in ADF liturgy, whether or not it’s an Indo-European concept, etc, etc, etc… I’ve been working on Liturgy 1, part of my Initiate training in ADF, so between that and the FB discussion, I couldn’t help but reflect on the gatekeeper and what it means to me and my rituals. The creation of a ritual center is often symbolized in Paleo-, Meso-, and Neopagan ceremonies as opening the Gates Between the Worlds. This is usually accomplished by calling upon a particular spirit who is a gatekeeper, and who is easy to contact, since he/she is usually halfway into this world already. The gatekeeper is then asked to open the gates, which she/he usually does with little fuss (32). Pagans may envision this gatekeeper differently depending on the purpose/desires for the ritual, one’s personal or grove hearth culture, and one’s tradition. Wiccans, for example, often call spirits in the four directions, be they elementals, guardians of watchtowers, or even angels. Though I’ve never heard them referred to as such in Wiccan circles, these spirits are gatekeepers (32). In ADF Druidic rites, many will call on messenger spirits or even psychopomps. The wonderful thing coming out of the online discussions seems to be that the gatekeeper concept does not have to be set in stone. Some suggest thinking of the gatekeeper is a guardian during our rites. Others see him or her as a facilitator – a spirit who can help you access the Otherworlds, but does not automatically assume that we can’t do it on our own. Personally, I work with Manannán mac Lir, Irish God of the sea, lord of magic, and arguably an excellent gatekeeper! Muin Mound Grove often calls to Manannán as well, and that’s where I first started to make my acquaintance with him. Personal study and experience has lead me to develop a relationship with him as a gatekeeper deity and, now, a patron to my Druidic studies. His association with water connects him with the Otherworld, and yet many stories show him interacting with humans such as Cuchulainn and Bran. One of my favorite stories features Cormac Mac Airt whom Manannán actually transports to the Otherworld, usually with the aid of a silver wand that tinkles like bells. I’ve taken my ideas about Manannán as a guardian to my protogrove. I had been leading rituals in the same way I was taught – using physical gestures and asking Manannán to help me open the gates. I began to sense a bit of a disconnect between the actions and the ritual participants. Many are new to Druidism, so that has been part of it, and I was struggling with how to help everyone better experience the gates. I wanted it to be understood and meaningful – else why bother? For our Spring Equinox ritual, I decided to approach the opening and closing of the gates as part of the Two Powers meditation. I lead everyone through the usual meditation and then, inspired by Ian Corrigan’s work in the Nine Moons material, I asked that everyone view the water and fire combine into mist that enveloped us. Out of the mist came a wizened, wizard of a man – Manannán mac Lir! He stood as guardian of the Otherworld but also was there to facilitate the magic of envisioning the fire and well as gates opening and closing. Everyone reported that this was very successful and they definitely felt an inner transition. I’m very excited by this development and intend to experiment with it further as our concept of the gatekeeper evolves. Some other ADFers are suggesting that Brighid would make a very appropriate gatekeeper given her association with fire and water and I find myself agreeing! I feel pulled to join in this experimentation as well since Brighid is my patroness, but I do not want to end my growing relationship with Manannán either. Perhaps I will approach Brighid that way during my flame keeping rites and see what happens. Those times, I usually do not call to a gatekeeper. They are very informal and hearth-centered – but we shall see! Perhaps in looking to Brighid as not only guardian of my home, but as a facilitator to greater spiritual awareness, I will grow. If you’ve been reading my blog for the past year, you know I’ve been working towards building an ADF Druidic community here in the North Country. It started in June with a “coffee hour,” and progressed into a few study group meetings – the first in Watertown and the second in Carthage. Our Facebook group has grown and, while discussion comes and goes, the interest remains. We’ve even attracted someone right across the border in Canada! Our next gathering is coming up this weekend and it is going to be a bit more than a study group meeting – I’m actually planning a ritual to frame the opening and closing of our time together. The purpose is to celebrate the new season and honor the Nature Spirits for their bounty. Since the group has been discussing Nature Spirits, it seemed right to make them the focus of this ritual. We’ll also discuss our next planned ritual, Samhain. Last weekend, I met with two of the study group members. They have both been very involved since the very first meeting – I felt they were ready to help me organize something bigger. The Autumn Equinox rite coming up is going to be very casual so as to “blend in” at the public park we’re meeting in. Since it’s our first ritual, I don’t want it to be too involved. Everyone is still learning and the less they have to keep track of, the better it will be. All the same, I will be sure everyone is involved in some way so they experience a sense of ownership and I don’t feel alone on stage. I’m hoping this only grows at Samhain. We’re still working on finding a more private yet accessible location for that rite… and we have a possibility in the works. When Weretoad and I left Muin Mound’s Autumn Equinox rite, he lamented the possibility of growing apart from them through forming a new group. I worried the same thing. We discussed it some as we took the long drive home. I asked him if he would be happier if I abandoned the possibility of starting a protogrove, but he insisted that I shouldn’t because he knows it’s important to me. I found myself asking why is it important. Am I just looking to play leader? But it isn’t just my desire to make things happen. There really is a desire in the North Country for something other than Wicca. Not only that, but there’s a desire for open community. Covens are hard to find, but ADF Druidism is all about opening its doors. This doesn’t come without some complications, but it’s necessary for such a group to be out there. I think most Pagans are into security and safety, but not everyone is into extreme secrecy. Some of us just want to come together, form friendships, educate/learn, work magic, and worship the Kindreds. I read about other groves who meet every month – sometimes twice a month! – to share discussion, healing, and fellowship. I used to be part of such a group in the Utica area and I loved it. I still get excited to see the people I met through that group. It’s not that I don’t get excited to see my grovemates in Syracuse – but I can’t see them as often because of proximity. I miss being able to meet without it being a big day trip. I miss being able to say, “Hey, who wants to meet for tea and casual Pagan discussion tonight?” without worrying about gas prices and getting home at a decent time for bed. I truly hope this study group turns into something more. Like my husband, I will miss seeing Muin Mound as often when the study group matures… but I know we won’t lose touch. Hell, I’m already plotting ways for the North Country group and Muin Mound to get together! At the same time, I’m not going to count my chickens before they hatch. The study group still has a lot of work to do to become something more. I don’t want to embark on the protogrove boat alone – I need to know everyone has my back and that we’re in it together. Perhaps by next June, we’ll be ready.